Rekeying is among the best methods of securing a brand new apartment or home. 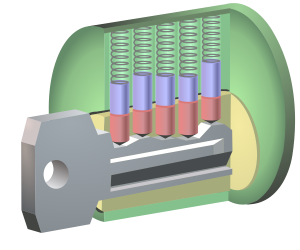 When you rekey a lock, the pins within the locks are modified. This means that you will still continue using the exact same locks that you found in the house, but you will need new keys. Therefore, it is the best alternative to doing a complete lock change and costs less as well. Some homeowners tend to put rekeying their lock off until it either wears or breaks down completely. However, the longer you wait to secure your locks, the more vulnerable your house becomes to theft and burglary. Additionally, secure locks will not only protect your family, but your belongings, too. When you relocate to a new house, you cannot really tell how many people have copies of the house keys. This is especially important since many people give out copies of their keys to roommates, friends, and relatives. As a result, it creates an unnecessary risk since you never know if they will use the extra keys to gain access to your home in the future. At this point, you will need swift rekey services from a reputable locksmith like Quick Key Service Sherman Oaks. Make sure your family is the only one that has extra keys to your house. Complete a rekey service on your house in the Sherman Oaks area by calling (818) 272- 8630 today. If your house has been undergoing renovation, then it is absolutely necessary to get a locksmith to rekey your locks. The main reason for this is that contractors may have been given copies of keys to your home. This means that they could access your house at another time when you are not at home, especially when dealing with a shady contractor. Therefore, when you rekey your locks with us, you can be sure that there won’t be any sort of foul play going on within your property. Choosing to rekey your locks will likely cost less money compared to doing a lock replacement or installing deadbolts. In addition, it’s much cheaper, especially if the house has multiple entry points. Just contact an expert locksmith to come and rekey the locks as soon as possible to guarantee your home’s safety. The locksmith should be able to change the internal pins and make sure that your keys are the only ones that will be used to access the house. When existing locks are made of high quality and already offer enhanced security, you do not need to replace them. Just get Quick Key Service Sherman Oaks to rekey your locks and enjoy its many extra benefits. This process does not take a long time, so plan to have it done when moving to a new place or when you feel that your locks may be compromised.